This view of the flare on Jan. 11, 2013, was recorded by NASA's Solar Dynamics Observatory. A huge sunspot known as AR1654 produced the M1-class flare at 4:11 a.m. EST (0911 GMT), officials with NASA's Solar Dynamics Observatory said in a description of the event. The SDO spacecraft is one of several sun-watching space telescopes keeping tabs on solar flares and other sun weather events. According to Spaceweather.com, sunspot AR1654 is growing more active and is now "crackling with M-class solar flares" like the one that erupted today. "AR1654 is getting bigger as it turns toward Earth," the website reported. "Not only is the chance of flares increasing, but also the chance of an Earth-directed eruption.This could be the sunspot that breaks the recent lengthy spell of calm space weather around our planet." The sun is in an active phase of its current 11-year weather cycle, which scientists call Solar Cycle 24. The sun's activity cycle is expected to reach its peak (or "solar maximum") in 2013, astronomers have said. This composite image shows the sun's active region AR1654 (marked) compared to the sizes of the Earth and Jupiter. Image posted by NASA Solar Dynamics Observatory outreach officials Jan. 9, 2013. The most powerful solar flares, X-class flares, have the most significant effect on Earth. They can cause long-lasting radiation storms in our planet's upper atmosphere and trigger radio blackouts. 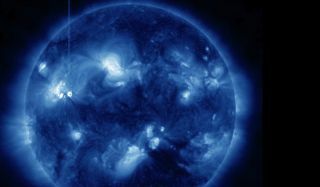 Medium-size M-class flares can cause brief radio blackouts in the polar regions and occasional minor radiation storms. C-class flares, the weakest in scientists' three-tiered classification system, have few noticeable consequences.